Investors from all wealth levels would select an older male advisor if they were asked to select an advisor based on appearance alone. 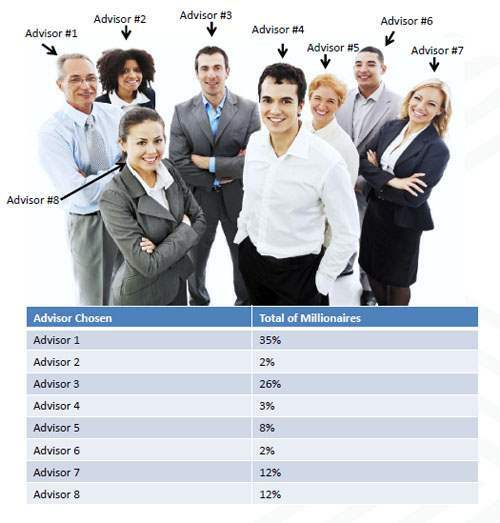 In Spectrem’s Wealth Segmentation Series Relationships with Advisors, investors were asked to choose an advisor based on a photo of eight adults, four men and four women, ranging in apparent age. Investors from all wealth segments chose the older male more often than any other choice. The report focuses on three wealth segments: Mass Affluent (with a net worth of between $100,000 and $1 million Not Including Primary Residence), Millionaire (with a net worth between $1 million and $5 million NIPR), and Ultra High Net Worth (with a net worth between $5 million and $25 million NIPR). Forty-one percent of UHNW investors selected Advisor 1 (see photo), while 35 percent of Millionaires and 31 percent of Mass Affluent investors chose that advisor. That advisor is wearing a shirt and tie with no jacket, is the oldest male in the photo, and is wearing eyeglasses. He has his arms crossed. In all segments, the next most popular choice was Advisor 3, who is a younger male wearing a jacket and dress shirt with no tie, and has his arms crossed as well. Twenty-six percent of Millionaires, 23 percent of Mass Affluent and 22 percent of UHNW investors chose Advisor 3. The third choice for all wealth segments was Advisor 7, a young blonde female. She is wearing a blouse and jacket and has her arms crossed. Seventeen percent of UHNW, 14 percent of Mass Affluent and 12 percent of Millionaire investors chose her. A similar choice is Advisor 8, another young woman. Unlike Advisor 7, her hair is dark, and she has her hair tied back behind her ears, where Advisor 7 had her hair down. Millionaire investors actually liked both women equally, with 12 percent selecting each. Twelve percent of Mass Affluent investors chose Advisor 8 and 9 percent of UHNW chose Advisor 8. The only other case of an advisor choice being selected by 10 percent of the segment was Advisor 5, an older woman, who was selected by 10 percent of Mass Affluent investors. Click here for more information on Relationships with Advisors.